While being a very useful vehicle to deal with mines, the main disadvantage of the Sherman Crab mine flail was that it could not be used to search for mine fields. Besides the fact that it was very slow when flailing (1.5 mph), the wear on the flailing chains when flailing constantly reduced its effectiveness when mines were found. Therefore several other types of anti-mine attachments were devised for both Sherman and Churchill, mostly in the form of rollers. The most effective of these was made by the Canadians and was known as the Canadian Indestructible Roller Device. It consisted of two arms attached to the side of the tank, each supporting a heavy roller. The roller was suspended in such a way it could jump in the air and rotate in an arc round the arm when a mine was detonated, thus reducing the chance of the rollers being blown off. Because of this construction, it did not have a limited life like the Crab on which chains which wore out or were blown off. It also had a higher speed, 5-7 mph and up to 15 on roads, and was therefore essentially a reconnaissance vehicle which could proceed at normal speeds. The device was available for D-Day and was shipped across the channel. Sherman CIRDs were issued as pilot tanks, on the scale of one per troop, to the three regiments of the 79th Armoured Division operating flail tanks in North West Europe. RAC Reports note that one of these, 30 Armoured Brigade, was equipped with "36 pilot Sherman Vs with 12 Roller equipments". However, there are no records of the CIRD being used in action and all units were withdrawn before the end of 1944. But it was tested again around February 1945. Before the crossing of the Rhine the 79th Armoured Division formed a number of experimental wings to deal with the problems expected when crossing the Rhine. F Wing was based at Geel, Belgium, and (among other things) tested a series of anti-mine devices, one of which was the "spectacular" CIRD. In December 1945 the Specialised Armour Development Establishment (SADE) continued to test the CIRD. Maybe no more than a dozen CIRDs were built. Photographs made during testing show various Sherman Vs (incl. T-148350) in use as pusher tanks. No devices themselves are known to survive, but a number of Shermans with the distinctive fittings on the hull sides are preserved. Noteworthy is that two of them survive in Canada which is odd since the CIRD was developed and tested by the Canadian Army in Great Britain. This is the first Sherman V with CIRD fittings that came to light in recent years. In 1992 Ed Storey 'discovered' it at Canadian Forces Base Kingston, Ontario, Canada, where it stood on the base golf course in the Gore Training Area. Its gun, mount, engine and engine deck are missing and the gun aperture in the turret is plated over. It is seen here at the Military Heritage Museum, Brantford, Ontario, Canada, to where it later moved. 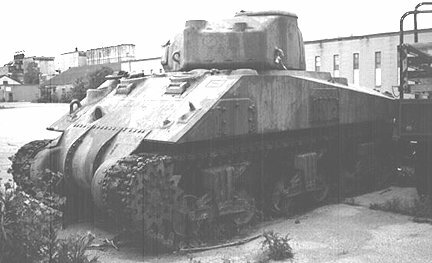 As of March 1999, this Sherman was being acquired by the Canadian War Museum at Ottawa. Reportedly, a set of rollers had also been found, but these tuned out not to be CIRD rollers. Scan provided by Chris Johnson. This M4A2 at CFB Borden Military Museum, Ontario, Canada, has the distinctive patches on the hull sides. The bolts to which the CIRD was fitted are missing, however. Note the hefty hitch welded to the front of the final drive housing. Scan courtesy of Fred Olsen. 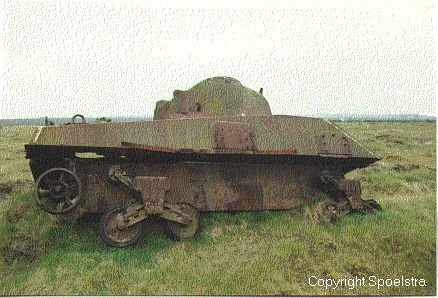 After WW2 a Sherman V with CIRD fittings ended up on one of the Commonwealth vehicle dumps in the Netherlands. It was taken into service as a normal gun tank by the Royal Netherlands Army and issued with registration number 34076. It ended up on a range were its shattered remains were photographed before it disappeared. Dingwall, Don (see the Links page). Half Yearly Reports on the Progress of the Royal Armoured Corps (via Peter Brown). Hunnicut, R.P., Sherman: a history of the American medium tank. Second edition. Novato: Presidio Press, 1978, p.302, 446 (ISBN 0-89141-080-5). Fletcher, David, Vanguard of Victory: the 79th Armoured Division. London: Her Majesty's Stationery Office, 1984, p.28, 29, 30, 56, 59 (ISBN 0-11-290422-X). 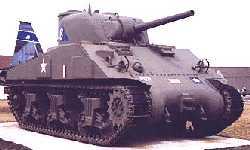 Fletcher, David, The Universal Tank: British armour in the Second World War part 2. London: HMSO, 1993, p.80, 94, 107 (ISBN 0-11-292534-X).